With all of the free crochet, knitting, quilting, sewing and craft patterns available there seems to be endless ways to save them. You can download them in PDF format, on to your iPad or Kindle or just try and print them for your collection. Sometimes we run across a pattern that we just don't know how to get it to print properly. That is where the Print Friendly Buttons come in handy. These buttons are available for Google Chrome, Firefox, Internet Explorer, Safari, iPad and iPhone as well as many other applications. It's easy enough to hit print but who wants to print all of the ads and everything else on the website? 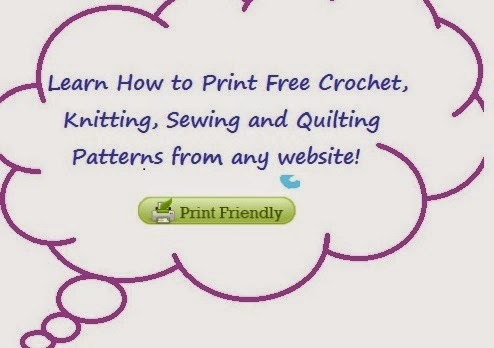 To learn more about how to use the print friendly buttons from your computer or tablet print all of your favorite patterns go directly to the Print Friendly Buttons site to use from the site or install on your computer.